Clear night ahead? Let’s see what’s up. We’ll start close to home with the Moon, zoom out to lonely Fomalhaut 25 light years away and then return to our own Solar System to track down the 7th planet. Even before the sky is dark, you can’t miss the 4-day-old crescent Moon reclining in the southwestern sky. Watch for it to wax to a half-moon by Thursday as it circles Earth at an average speed of 2,200 mph (3,600 km/hr). That fact that it orbits Earth means that the angle the Moon makes with the sun and our planet constantly varies, the reason for its ever-changing phase. With the naked eye you’ll be able to make two prominent dark patches within the crescent — Mare Crisium (Sea of Crises) and Mare Fecunditatis (Sea of Fecundity). Each is a vast, lava-flooded plain peppered with thousands of craters , most of which require a telescope to see. Not so Janssen. This large, 118-mile-wide (190-km) ring will be easy to pick out in a pair of seven to 10 power binoculars. Janssen is named for 19th century French astronomer Pierre Janssen, who was the first to see the bright yellow line of helium in the sun’s spectrum while observing August 1868 total solar eclipse. English scientist Norman Lockyer also observed the line later in 1868 and concluded it represented a new solar element which he named “helium” after “helios”, the Greek word for sun. Helium on Earth wouldn’t be discovered for another 10 years, making this party-balloon gas the only element first discovered off-planet! Directing your gaze south around 7 o’clock, you’ll see a single bright star low in the southern sky. This is Fomalhaut in the dim constellation of Piscis Austrinus, the Southern Fish. The Arabic name means “mouth of the fish”. If live under a dark, light-pollution-free sky, you’ll be able to make out a loop of faint stars vaguely fish-like in form. Aside from being the only first magnitude star among the seasonal fall constellations, Fomalhaut stands out in another way — the star is ringed by a planet-forming disk of dust and rock much as our own Solar System was more than 4 billion years ago. Within that disk is a new planet, Fomalhaut b, with less than twice Jupiter’s mass and enshrouded either by a cloud of dusty debris or a ring system like Saturn. 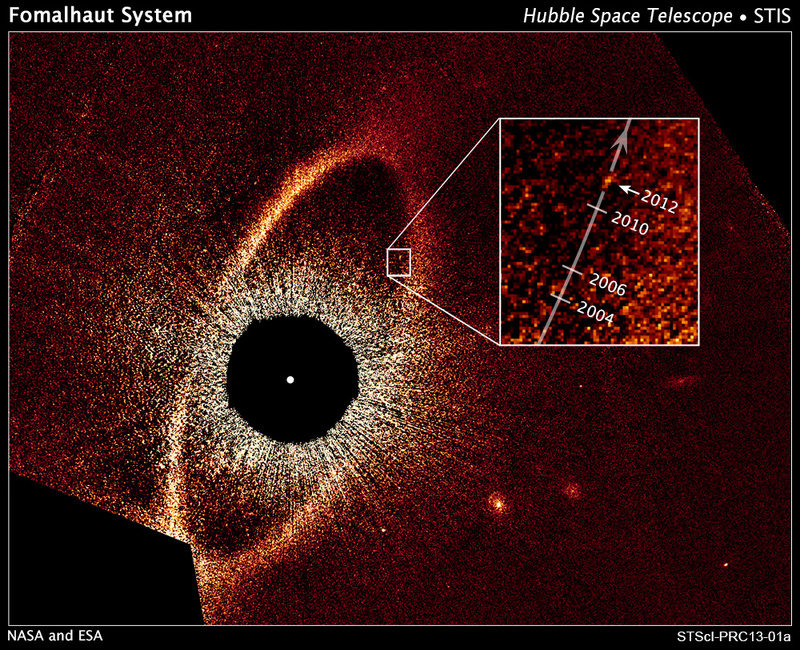 Fomalhaut b has the distinction of being the first extrasolar planet ever photographed in visible light. The plodding planet takes an estimated 1,700 years to make one loop around Fomalhaut, with its distance from its parent star varying from about 50 times Earth’s distance from the sun at closest to 300 times that distance at farthest. Next, we move on to one of the more remote planets in our own solar system, Uranus. The 7th planet from the sun, Uranus reached opposition — its closest to Earth and brightest appearance for the year — only a month ago. It’s well-placed for viewing in Pisces the Fish after nightfall high in the southeastern sky below the prominent sky asterism, the Great Square of Pegasus. A telescope will tease out its tiny, greenish disk, but almost any pair of binoculars will easily show the planet as a star-like point of light slowly marching westward against the starry backdrop in the coming weeks. Check in every few weeks to watch it move first west, in retrograde motion, and then turn back east around Christmas. For those with 8-inch and larger telescopes who love a challenge, use this Uranian Moon Finder to track the planet’s two brightest moons, Titania and Oberon, which glimmer weakly around 14th magnitude. We’ve barely scratched the surface of the vacuum with these offerings; they’re just a few of the many highlights of mid-November nights that also include the annual Leonid meteor shower, which peaks Tuesday and Wednesday mornings (Nov. 17-18). So much to see! Thanks for the viewing suggestions Bob! Don’t forget the Leonids on the night of the 17th and morning of the 18th! This year’s show won’t be at storm levels but could produce some notable fireballs? I’ll hopefully get over my head cold by then and will go up to a nearby mountainside star gazing spot I like. The Leonids are the best birthday present a guy could ever ask for and happen every year! Next PostNext Who was Albert Einstein?